Sprite is the third most popular soft drink brand, behind Coke and Pepsi. College students are heavy users of soft drinks. 1. As the brand manager for Sprite, what information do you need to target this segment? 2. Search the Internet, as well as your library’s online databases, to obtain information that will assist the brand manager of Sprite in targeting the student segment. 3. You and a fellow student each interview a different respondent (another student) to determine preferences for soft drinks, without constructing a questionnaire. How comparable are the data each of you obtained? Next develop a formal questionnaire jointly and each of you administer it to another respondent, Are the data you two obtained more comparable than before? What does this teach you about the importance of a questionnaire? A questionnaire, whether it is called a schedule, interview form, or measuring instrument, is a formalized set of questions for obtaining information from respondents. 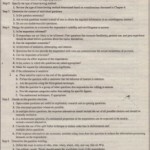 Typically, a questionnaire is only one element of a data-collection package that might also include (1) fieldwork procedures, such as instructions for selecting, approaching, and questioning respondents (2) some reward, gift, or payment offered to respondents; and (3) communication aids, such as maps, pictures, advertisements, and products (as in personal interviews) and return envelopes (in mail surveys) Regardless of the form of administration, a questionnaire is characterized by some specific objectives. Any questionnaire has three specific objectives. First, it must translate the information needed into a set of specific questions that the respondents can and will answer. Developing questions that respondents can and will answer and that will yield the desired information is difficult. Two apparently similar ways of posing a question may yield different information. Hence, this objective is a challenge. Second, a questionnaire must uplift, motivate, and encourage the respondent to become involved in the interview, to cooperate, and to complete the interview. Incomplete interviews have limited usefulness at best. In designing a questionnaire, the researcher should strive to minimize respondent fatigue, boredom, incompleteness, and nonresponse. A well-designed questionnaire can motivate the respondents and increase the response rate, as illustrated by the Census 2000 questionnaire in the opening example. Third, a questionnaire should minimize response error. The potential sources of error in research designs were discussed in Chapter 3, where response error was defined as the error that arises when respondents give inaccurate answers or their answers are misrecorded or misanalyzed, A questionnaire can be a major source of response error. Minimizing this error is an important objective of questionnaire design. The great weakness of questionnaire design is lack of theory. Because there are no scientific principles that guarantee an optimal or ideal questionnaire, questionnaire design is a skill acquired through experience. It is an art rather than a science, Stanley Payne’s The Art of Asking Questions, published in 1951, is still a basic work in the field 3 This section presents guidelines use to beginning researchers in designing questionnaires, Although these rules can help you avoid major mistakes, the fine-tuning of a questionnaire comes from the creativity of a skilled researcher. The first step in questionnaire design is to specify the information needed. This is also the first step in the research design process, Note that as the research project progresses, the information needed becomes more and more clearly defined, It is helpful to review components of the problem and the approach, particularly the research questions, hypotheses, and the information needed, To further ensure that the information obtained fully addresses all the components of the problem, the researcher should prepare a set of dummy tables. A dummy table is a blank table used to catalog data. It describes how the analysis will be structured once the data have been collected. It is also important to have a clear idea of the target population. The characteristics of the respondent group have a great influence on questionnaire design. Questions that are appropriate for college students may not be appropriate for housewives. Understanding is related to respondent socio eonomic character.sues. Furthermore, poor understanding is associated with a high incidence of uncertain or no-open responses The more diversified the respondent group, the more difficult it is to design a simple questionnaire that is appropriate for the entire group. 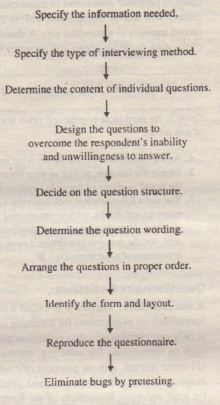 An appreciation of how the type of interviewing method influences questionnaire design can be obtained by considering how the questionnaire is administered under each method In personal interviews, respondents see the questionnaire and interact face 10 face with the interviewer, Thus, lengthy, complex, and varied questions can be asked. In telephone interviews, the respondents interact with the interviewer, but they do not see the questionnaire. This limits the type of questions that can be asked to short and simple ones (see the department store project), Mail questionnaires are self-administered, so the questions must be simple and detailed instructions must be provided. In computer-assisted interviewing (CAPI and CATI), complex skip patterns and randomization of questions to eliminate order bias can be easily accommodated. Internet questionnaires share many of the characteristics of CAPI, but e-mail questionnaires have to be simpler. Questionnaires designed for personal and telephone interviews should be written in a conversational style. In the department store project example, ranking IO stores is too complex a task to be administered over the telephone. Instead, the simpler rating task, where the stores are rated one at a time, is selected to measure preferences. Note the use of cards to facilitate the ranking task in the personal interview. Interviewer instructions (typed in capital letters) are much more extensive in the personal interview. Another difference is that whereas the respondent records the ranks in mail and electronic surveys, the interviewer records the store names in the personal interview. The type of interviewing method also influences the content of individual questions. 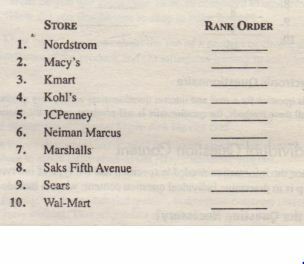 Please rank-order the following department stores in order of your preference to shop at these stores, Begin by picking out the one store that you like most and assign it a number 1, Then find the second most preferred department store and assign it a number 2, Continue this procedure until you have ranked all the stores in order of preference. 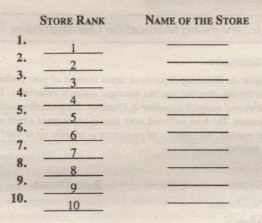 The least preferred store should be assigned a rank of 10. No two stores should receive the same rank number The criterion of preference is entirely up to you. There is no right or wrong answer Just try to be consistent. This question for e-mail and Internet questionnaires will be very similar to that for the mail questionnaire in all these methods, the questionnaire is self-administered by the respondent. Once the information needed is specified and the type of interviewing method decided, the next step is to determine individual question content: what to include in individual questions. 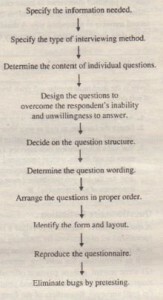 Every question in a questionnaire should contribute to the information needed or serve some specific purpose, If there is no satisfactory use for the data resulting from a question, that question should be eliminated, As illustrated in the opening example, a hard look at the 1990 Census of Population short form resulted in the elimination of questions pertaining to five Subjects. In certain situations, however, questions may be asked that are not directly related-to the information that is needed. It is useful to ask some neutral questions at the beginning of the questionnaire to establish involvement and rapport. particularly when the topic of the questionnaire is sensitive or controversial, Sometimes filler questions are asked to disguise the purpose or sponsorship of the project, Rather than limiting the questions to the brand of interest, questions about competing brands may also be included to disguise the sponsorship, For example, a survey on personal computers sponsored by HP may also include filler questions related to Dell and Apple. Questions unrelated to the immediate problem may sometimes be included to generate client support for the project, At times, certain questions may be duplicated for the purpose of assessing reliability or validity. Are Several Questions Needed Instead of One?